"It typically takes about seven seconds for someone to make a first impression and about five to 15 minutes for a recruiter to make a decision. We want to challenge that," explains Elin Öberg Mårtenzon, chief innovation officer at TNG's office in central Stockholm. 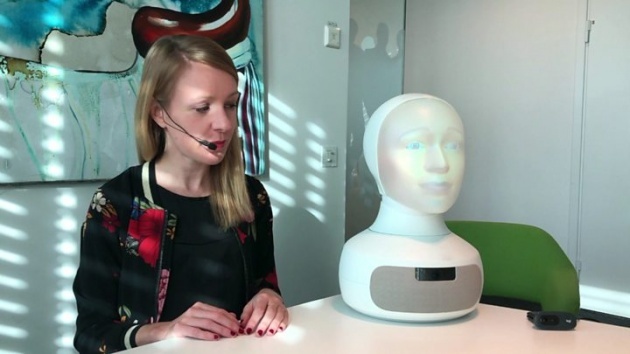 The world's first robot designed to carry out unbiased job interviews is being tested by Swedish recruiters. Her name is Tengai. Measuring 41cm (16in) tall and weighing 3.5kg (7.7lbs) she's at eye level as she sits on top of a table directly across from the candidate she's about to interview. Her glowing yellow face tilts slightly to the side. Then she blinks and smiles lightly as she poses her first question: "Have you ever been interviewed by a robot before?" Tengai is the brainchild of Furhat Robotics, an artificial intelligence (AI) and social robotics company born out of a research project at Stockholm's KTH Royal Institute of Technology. The firm has spent the past four years building a human-like computer interface that mimics the way we speak, as well as our subtle facial expressions. The idea, according to chief scientist Gabriel Skantze, is that "it feels much less scary or strange compared to a more traditional robot". Since October 2018, the start-up's been collaborating with one of Sweden's largest recruitment firms, TNG. The goal is to offer candidates job interviews that are free from any of the unconscious biases that managers and recruiters can often bring to the hiring process, while still making the experience "seem human".